HoneyColor order - Geo Angel Green - Cherry Colors - Cosmetics Heaven! 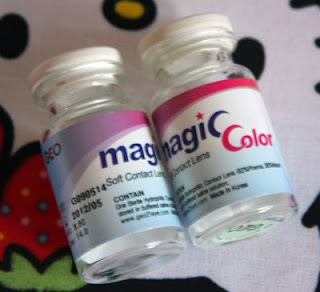 It's a site which sells circle contact lenses such as Geo, Neo and Eos. 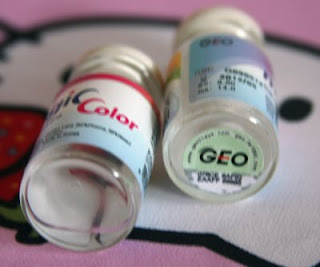 Most of you probably know the Geo circle lenses. Well they have most of the things in stock, so you don't have to wait for one month so they receive the item (+ the shipping time), but you get the items right away! Plus the shipping is really cheap! So I paid for my pair 22,90$ + 3$ for shipping (worldwide! Each additional pair is +0,50$ shipping). ---> now they have -15% on all orders - summer sale! On other sites you have to wait (and I hate waiting) and you have shipping that is so much more expensive! I couldn't resist and I had to try them on ASAP! And I... I freaked out, when I looked in the mirror. Honestly. I freaked out! xD My eyes were HUGE and dark. I looked as an alien, well to myself. My boyfriend didn't notice! But the lenses are super soft and thin! They almost feel like paper in compared to my regular Acuve Osasys with Hydraclear! Oh right, I have some slight astigmatism on my right eye. But not much so I can wear regular contact lenses and they don't bother me. My dioptre usually goes down for -1 each year, but since I'm over puberty I think it shall go only better now. 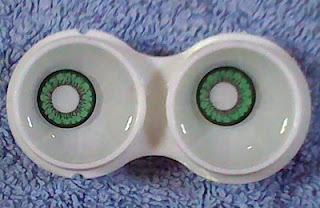 The already ripped off lenses thing.. without the lenses.. lol. I think I will order more from them.. Yep! Next time I'll try the black circle... Oh man, I wish I had black/brown eyes. Those circle lenses look so much better on brown and black eyes :(. 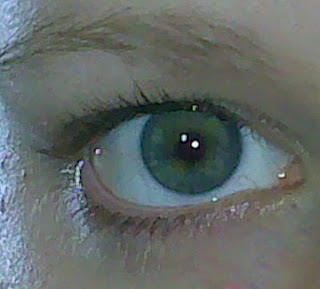 Tho the difference between my oliveish green with a tad blue and brown eyes color isn't too obvious in natural light. 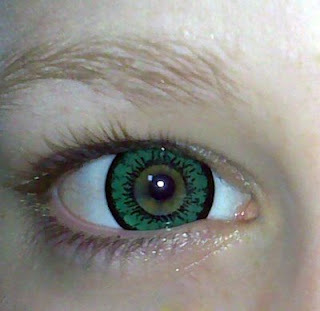 Later I will take more pictures of me wearing them.. but I'll have to do my MU first xD! Well, how do you like them? Do check them out! HoneyColor!